Tag line: "There's one in every family"
A sci-fi / fantasy with a Hawaiian setting and a soundtrack filled with Elvis Presley songs, Lilo & Stitch is one of Disney’s most unusual animated features, telling the story of an out-of-control alien from outer space and a high-spirited young orphan girl who, regardless of their differences, desperately need each other. Stitch (voiced by Chris Sanders), who at the start of the movie is referred to only as Experiment 626, is a highly aggressive alien, a genetic mutation created in the laboratory of Dr. Jumba Jookiba (David Ogden Stiers). Fearing his volatile nature, the Galactic Federation exiles 626 to a distant asteroid, but during transport the creature manages to steal a space cruiser and make his way to earth, coming to rest on the Hawaiian Island of Kauai. Following an unfortunate run-in with a truck, Experiment 626 is mistaken for a dog and shuffled off to an animal shelter, where he’s eventually adopted by Lilo (Daveigh Chase), a young Hawaiian girl who, since the death of her parents, has been under the care of big sister Nani (Tia Carrere). But with a social worker (Ving Rhames) breathing down their neck, Nani must face the real possibility that Lilo, who has a hard time making friends, may be taken away and placed in a foster home. While this is going on, Experiment 626, named “Stitch” by his new “owner”, is trying to evade Dr. Jumba, who’s been sent to earth along with his assistant Pleakley (Kevin McDonald) to recapture him. But when an intergalactic bounty hunter (Kevin Michael Richardson) puts Lilo in harm’s way, Stitch must rely on all of his skills to save his new best friend, even if it costs him his freedom. The true appeal of Lilo & Stitch lies in the relationship that develops between its two lead characters. A rambunctious kid with no friends, Lilo is thrilled when Nani allows her to adopt a dog, but at the shelter she instead takes an immediate liking to the runaway alien, who she lovingly names Stitch. Though a bit apprehensive at first (mostly because she’s not convinced Stitch is really a dog), Nani lets Lilo bring Stitch home with them, a decision she quickly regrets (especially when the alien’s behavior costs her a much-needed job). Yet despite the chaos they unleash (some of which causes large-scale destruction), the truth of the matter is that Lilo & Stitch, both of whom feel out of place in their respective worlds, are absolutely perfect together. 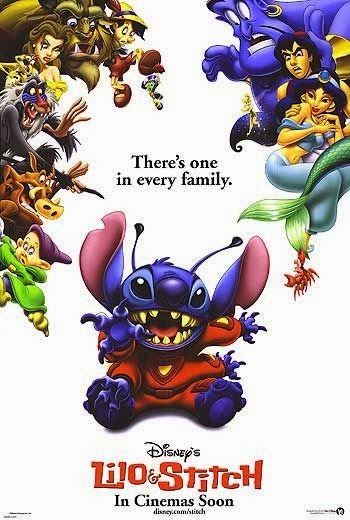 Featuring what’s arguably the most atypical family unit ever to populate a Disney movie (a pair of orphan girls and a space alien), Lilo & Stitch was a big hit for the studio at a time when it really needed one (its two previous animated efforts, 2000’s The Emperor’s New Groove and 2001’s Atlantis: The Lost Empire, were considered box-office failures). A genuinely funny film that, on occasion, crosses the line into tragedy, Lilo & Stitch packs plenty of personality into its 85-minute runtime, and is guaranteed to bring a smile to your face. I have a real soft spot for this one!